‘Kawasaki Dreaming?’ you ask! Well, I needed a reason to try making a theme based bowl. While I could come up with numerous themes, I really wanted to do something for someone that would have great meaning. I won’t go into the detail about who this was made for, but he does have a collection of Kawasaki motor bikes. I expected that anybody with a collection of Kawasaki motor bikes would have a strong love for the brand and really appreciate something unique and related. First, a little research to discover the logo used and colours. Well, there are a few versions and a few different colours used. My choice of colour really came down to the glass I had available, and the logo design selected came down to what I could best replicate in glass. The final design included the logo, as you will see in the piece, along with a stylised helmet. Just to be sure my idea would work, the first thing I did was to make a cut down test piece with all the design elements. 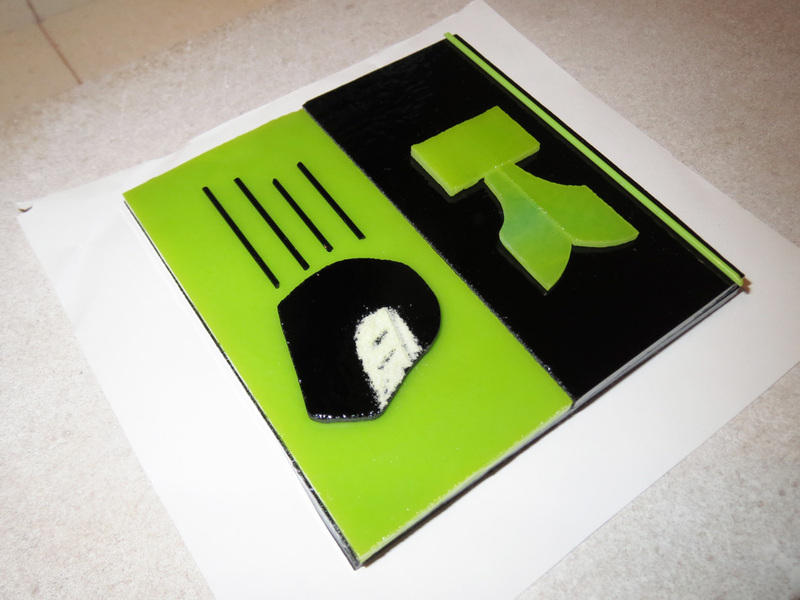 This was about the size of a coaster, 100mm square, included all the colours, Bullseye Green (0126) and black, and a small version of the logo and the helmet. The logo and helmet were made from 2mm glass, and the base from 3mm. On the helmet I use ground transparent yellow frit to define the visor for the helmet, hoping it would dilute the black a little to give some transparency. In this photo you can see the layup prior to fusing. I fused this in one go, but watched carefully to halt processing at a point where there the logo and helmet were still raised above the surface and well defined. The test worked well, so I confidently pressed on with the full version. The first step was to make the fused square that would later be slumped into a mold. The mold I decided to use was a square mold with sides that sloped down to a flat bottom. The base piece needed to be 260 mm square to fit the mold. 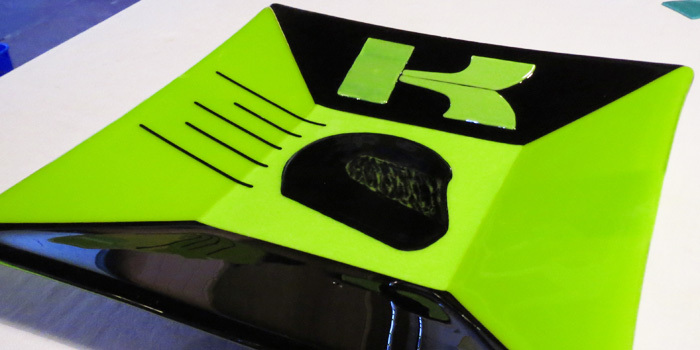 Kawasaki Dreaming – Fully fused base with deco in place prior to tack fuse. In this photo of the fully fused piece, before the decoration tack fuse, you can see the final design. It still included all the elements from the test piece, but with angular side pieces to better fit the square mold. At first I considered making the base plain black, but to get better light through the piece I decided on clear with a central green stripe. 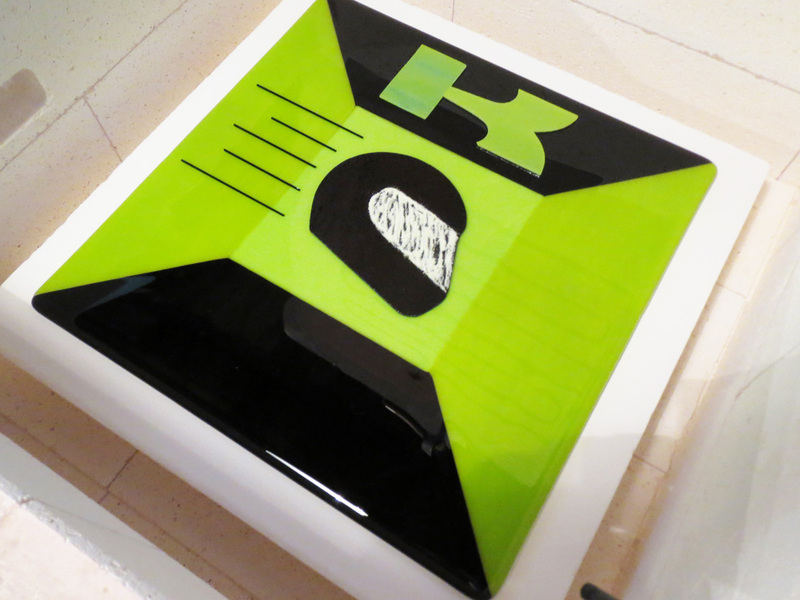 Kawasaki Dreaming – Underside of full fused base. 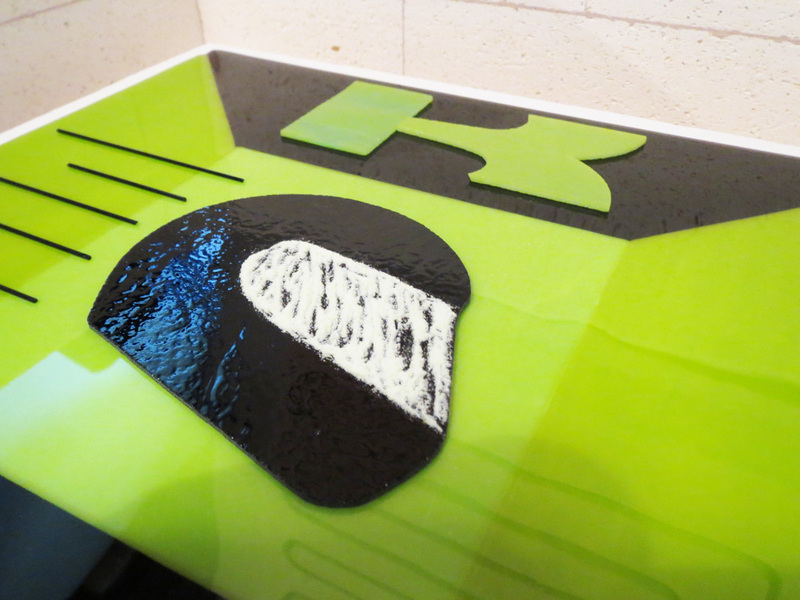 You can see in this photo of the fused piece how the underside was setup with 2 side pieces of clear, 260mm x 105mm, and then a central green strip, 260mm x 50mm. All pieces were 3mm. This approach gave a nice 3D effect to the base. 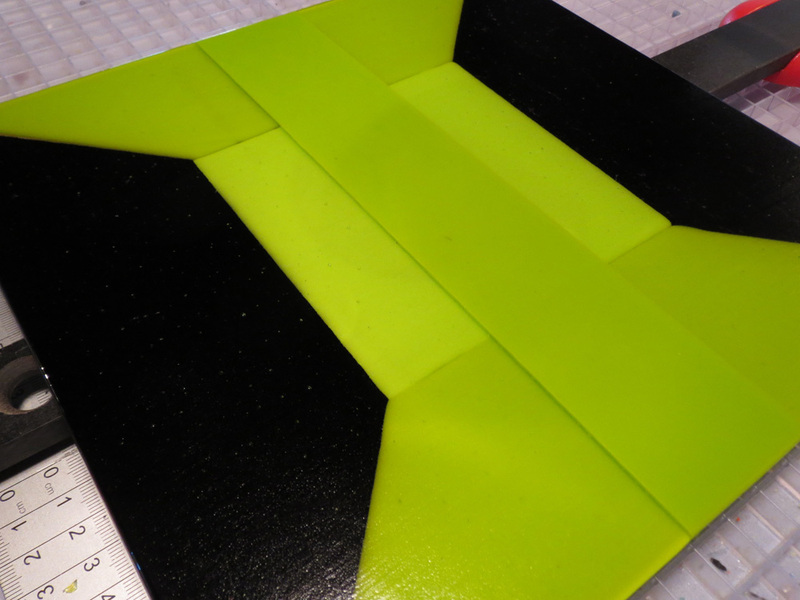 Then on top of this I added a central square of 3mm green. Around this are 4 angular side pieces, 2 green and 2 black, with opposing sides the same colour, as you can see in the photo above. Cutting and shaping the angular side pieces took quite a bit of to and fro with the grinder to get acceptable fits with the angles. Just to be safe, I decided to first full fuse the base, then add the logo, helmet and speed lines later in a tack fuse. The firing schedule for the full fuse is below. Of course, everything was thoroughly cleaned and assembled on Bullseye Thinfire paper. I prefer paper as I have had issues with full fuse on a prepared shelf. Sometimes, the separator sticks to the glass and is a pain to remove. With the full fuse complete it was then time to add the logo, helmet and speed lines decoration. The logo was a little challenge and I decided to make it from 3 pieces of thin 2mm green. These were first marked out on a small sheet of glass then cut roughly to shape. Using my grozing pliers I refined the shape a little more, then finished it on the grinder. Being top pieces I knew they wouldn’t join perfectly when fired, but this is art and I don’t want everything to be perfect. The helmet was made from 2mm black, and proved to be much easier to craft. Just as on the test piece I sprinkled transparent yellow frit in a streaky pattern to define the visor. The speed lines were simply stringers. Everything was assembled on a prepared shelf and fired to a tack fuse, observing regularly once at the processing temp to ensure the decoration remained slightly raised for definition. The tack fuse firing schedule for the kiln is below. The final piece looked fantastic. It turned out just as I hoped. As I have said before, I don’t want my art pieces to look perfect. To me something that looks perfect looks manufactured and that isn’t what I am all about. In the second part to this post I will go through the slumping into the final bowl. Please be aware that all kilns fire differently and this schedule may not produce the same results in your kiln. Previous post: Do you want to be inspired!! Want to keep up with what we are doing. Subscribe to our Newsletter / Blog. If you're looking for something in particular, and can't find it, why not ask a question so we can look at finding the answer for you?